This style of beer, known as a Euro Dark Lager, has its origins in Franconia, Germany as well as parts of Bohemia across the border in the Czech Republic. Efes Dark serves as a stronger, darker counterpart to Anadolu Efes’ hugely successful Efes Pilsener. Just like their pilsener, it is produced using bottom fermenting yeast, as all lagers are. These lager yeast give Efes Dark a characteristically clean and crisp flavor, which when combined with roasted malts, account for its distinctive, hearty flavor and deep ruby red color. On the nose you’ll notice obvious notes of roasted, caramel malts, with more subtle tones of molasses, dark ripened fruit and perhaps a hint of coffee. The aroma also presents a slightly vinous kick, partially due to the 6.5% ABV. The flavor is rich, malty sweet, roasted, and medium-bodied, with a chocolate undertone and a slight hop bitter finish. Expect this beer to sweeten a bit as it warms, at which point the alcohol presence will be more readily detectable. Overall, a very clean and flavorful brew, Efes Dark was awarded the Gold medal in the Best Beer category at 1998's Monde Selection Brussels competition. We suggest pairing this with fried mushrooms or some thick vegetarian chili if you’re looking an edible complement. If however you are looking for a great cigar to smoke with this dark lager, try a mildly earthy, leathery cigar of moderate strength. 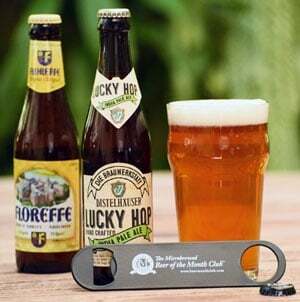 Hey, cigars and beers literally go hand-in-hand—why not supplement your beer club membership with a subscription to our Premium Cigar of the Month Club? Each month you’ll receive five ultra-premium cigars hand picked by our panel of cigar aficionados, along with an informative newsletter which features in depth reviews of every cigar we feature. Also included in each cigar review are suggested alcohol pairings to enhance your experience. And, if you like what you’ve received, we offer our members discounted prices on cigar reorders. One of our most popular clubs, when paired with your beer club membership, we can hardly imagine a better way to unwind at the end of a long day than with a handcrafted brew and a top notch cigar. Come to think of, we’ve earned ourselves a little break since we’ve come to the end of this month’s newsletter. Time to take some of our own advice and relax… Ahhh, the little luxuries of life. Cheers! Every now and again we get mail from our readers describing their visits to the breweries we’ve featured. We’re going to wager a small bet that no one is going to send a letter describing their trip to Anadolu Efes Brewery, located in Bahüelievler-Haznedar—now, we know what you’re thinking—isn’t that in Jersey somewhere? No friends, it’s in Turkey; in the historic city of Istanbul to be exact. Not that this wouldn’t be a desirable brewery to visit—state of the art and always in operation, the Anadolu Efes Brewery might be a popular tourist spot for some, but for most of us, the remarkable historic sites of Istanbul will consume the majority of one’s visit time. Not well known for its brewing trade, Turkey has a relatively young beer industry as far as private enterprises are concerned. 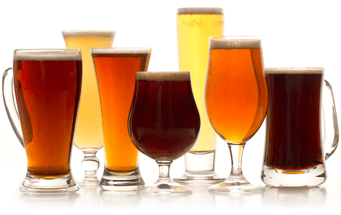 Beer production in Turkey began in 1890 through a brewery founded in Istanbul by two Swiss entrepreneurs. This brewery was later nationalized along with another in Ankara in 1939, during which time Tekel, a state enterprise, was the only beer producer in Turkey. Following a change in the brewing regulations in 1955 that permitted private enterprises to produce beer, the first breweries of Efes Beverage Group, Erciyas Biracilik and Ege Biracilik, started their operations in 1969. Since then, the Turkish beer market has shown significant growth. At the end of 2003 per capita beer consumption in Turkey reached 11 liters, a nearly three-fold increase from 4 liters in 1986. Even after this significant growth, per capita consumption in Turkey is still low compared to averages of Europe, the USA or even Eastern Europe. However, a growing tourism industry, changing consumption patterns and a developing economy are all contributing to an upswing of beer consumption in Turkey. Today, the young and dynamic Anadolu Efes group has five breweries, two malteries and one hop processing facility located within the Turkish borders. Additionally, they control nine more breweries and two more malteries across a network that spans six nearby nations in Eastern Europe and Central Asia, making them the fastest growing brewer in these, the fastest growing beer markets in the world. It would seem that as many civilizations before them have done, they too are using their strategic location in Istanbul, a city long recognized and fought over for its ideal position between the European and Asian continents, to their full advantage. Their brands are currently produced in Serbia-Montenegro, Romania, Moldova, Russia and Kazakhstan. Clearly, they are actively engaged in their boldly stated vision of “becoming the leading Beverage Group in the region spanning from the Adriatic Sea to China”. While the Efes name is unfamiliar to most in the states, the name is practically synonymous with beer in Turkey where the Anadolu Efes Group holds approximately 77% of the market share and accounts for about 74% of the country’s total brewing capacity. Certainly, they’re the undisputed leading brewer in Turkey, but they’re also among the largest brewing groups in Europe. Not exactly a microbrewery, but still a producer of solid brews that you’d have a very rough time acquiring here in the states, we felt that bringing you their Efes Dark would be an appreciated effort. Enjoy! For more information about the Anadolu Efes Brewery, check out their web site at http://www.efesbev.com.